​Sydney, 18 May 2016- A drop in sublease availability in Melbourne has levelled out slight increases in Sydney and Brisbane, according to the latest Sublease Barometer report from CBRE. In Q1, the total volume of sublease space in Australia’s sublease markets was down by 4,200sqm to 320,600sqm. Melbourne recorded the largest drop, decreasing by 21% over the quarter to reach its lowest level in over two years. Perth also decreased, while Sydney and Brisbane both recorded increases. CBRE Regional Director, Office Services, Andrew Tracey said that Melbourne was experiencing rising rents and lowering vacancy level, as well as a general increase in business confidence levels. “Melbourne CBD has been seeing a solid take up, particularly in better quality space with fitout in situ. Good quality sublease space is moving well. This is resulting in positive net absorption off the back of growth in white collar employment. The take up of better opportunities is leading to solid rental growth in the CBD proper with the market moving quickly back towards equilibrium rather than sitting firmly in the favour of the tenant as is has for the past seven or eight years,” Mr Tracey said. 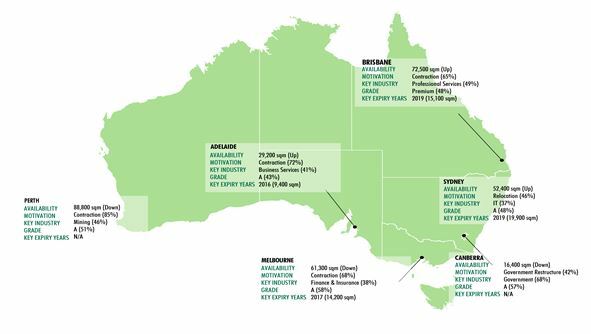 The report states that nationally, the resource sector is the major source of sublease availability, concentrated mostly in Perth and Brisbane. Sydney – After a large decline in Q4 2015, sublease space in the Sydney CBD rose by 3,200sqm in Q1 2016 to total 52,400sqm. Availability is likely to ease again over the remainder of the year, however, as tenants relocate from secondary stock being withdrawn for conversion to alternate uses. Space offered by the Financial & Insurance Services sector continues to trend down with just 3,800sqm now available, down from 18,600sqm one year ago. Melbourne – Sublease availability totalled 61,300sqm in March 2016, declining 21% (or by 15,900sqm) over the quarter to its lowest level in over two years. The Finance and Insurance sector remained the largest source of availability, despite recording a decline of 30% (or 5,980sqm) over the quarter. Despite contraction remaining the primary driver of availability, with 68% of space offered for this reason, the quarter recorded a substantial drop in the actual amount of space offered as a result of contraction, down 21,750sqm from Q4 2015. This represents the lowest contraction driven availability seen in over two years. Brisbane – As expected, the impact of the completion of 480 Queen Street and 180 Brisbane has driven a renewed spike in sublease availability to 72,500sqm, a level last seen in mid-2014. Contraction remains the dominant reason for subleasing space, accounting for 65% of availability (or 46,800sqm). Perth – Sublease availability dropped by just under 9,500sqm to 88,800sqm during Q1. The decline, however, was driven predominantly by space converting to direct vacancy as leases end their initial terms. The Mining sector remains the major source of availability, although the amount of sublease space offered by the sector did decline by just under 10,000sqm over the quarter to 40,900sqm (46% of total availability). Adelaide – Sublease space totalled 29,180sqm at the end of March 2016, an increase of 6,970sqm (or 31%) over the quarter. The Property and Business Services sector continues to provide the most sublease space, totalling 9,620sqm, unchanged over the quarter but up by 3,000sqm since the start of 2015. Other industries driving availability were Mining, Manufacturing & Construction (7,260sqm) and Finance & Insurance (4,100sqm). Canberra – Sublease availability measured 16,400sqm in the March quarter, a slight improvement from the 16,900sqm recorded in December and continuing the downward trend evident over the past year. Sublease vacancy in the City Centre is becoming increasingly scarce with just 6,400sqm available down from 48,900sqm one- year ago.